Growing up in the agriculture industry we often take for granted the fact that we understand where our food comes from, what goes into making the clothes we wear and how many resources are involved in constructing the roof over our head; it’s hard for us to believe that others within our community are so far removed from agriculture that they do not know these facts. When advocating for the beef industry, we must show consumers that we care. We care about their concerns, their thoughts and their opinions. This can oftentimes be a challenge, as we disagree with and can see right through their point of view. The best way to show that we care is let our passion shine, which we are proud to do here at HeartBrand. We share our photos, our lives and more with our customers and the public. 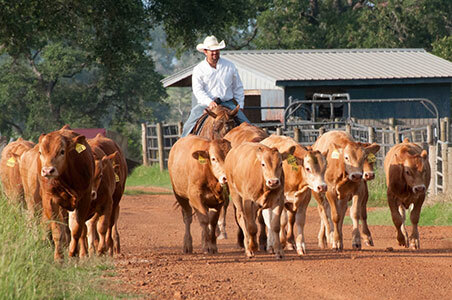 We are proud to show the hours we put into animal health, good nutrition, and overall well being of our cattle. We must let this everyday passion be the center of our discussion with consumers. 2. Have Confidence through your Passion. Your confidence will shine through with your passion. When talking with consumers about the beef industry, approach each conversation opportunity with confidence. There is no need to get nervous, remember you are talking about things you do every single day – just pretend that you are talking to your family. It will come across as authentic and genuine, the key to building relationships with those who are less familiar with your way of life. We often feel like we have to wait for the perfect moment to do everything. Good news, you don’t have to. Find simple everyday opportunities to talk with people about the industry you love – the grocery store, doctor’s office and church are some prime examples. We’ve found some of our most enjoyable conversations to be those with chefs and consumers at restaurants who love our steaks, and their great eating experience makes them crave more! More steak, and more of the beef industry’s story! Keep yourself in the know with all of the happenings and current events within your industry. You likely already have at least a handful of places you regularly visit to view this sort of information. It is also important to keep an eye out for trendy misinformation. One day no one had ever heard about What the Health and the next day all of Facebook was talking about it. This is a given, but it is important to stay connected with those in your industry – think of everyone from pasture to plate. Each and every person from the producer to the trucker to the consumer play a vital role in the industry as a whole. Each person has a different perspective and skill set. You never know when you will need them as a resource.Here at HeartBrand, we are driven to be advocates for the beef industry. We hope you enjoyed some of our tips and if you are at the upcoming NCBA convention stop by our booth and see us!